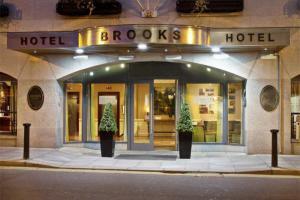 Situated only minutes from Grafton Street in the fashionable heart of Dublin City, Brooks Hotel offers easy access to the city’s key attractions including the best shopping streets in the capital, St. Stephen’s Green, the Guinness storehouse, Dublin Castle, Trinity College and many popular art galleries, theatres, museums and entertainment venues. Luxuriously appointed rooms coupled with excellent food, fine wines and exemplary levels of customer care and service, make a visit to Brooks a special and rewarding experience. Located on Drury Street, just a short stroll from Grafton Street and Dublin's most popular attractions. The hotel is approximately eight miles from Dublin Airport. Jasmine Bar and Café Lounge; Francesca’s Restaurant - organic and artisan dishes with sourced locally ingredients. Croke Park Experience, Dublin Writer's Museum, Dublin Zoo, National Gallery of Ireland, St. Stephen's Green, Dublin Castle, Trinity College, The Irish Whiskey Museum.